After Inktober I always go a little bit quiet because projects, commissions and basically my whole life gets put on hold for a month. So November is usually spent catching up and getting back into the swing of things. Now I have finally got a chance to tell you guys about how I found it and what I did differently this year. For those of you who have been following my work for a while you will know my pieces tend to be black and white but this year I decided to switch things up. It is SO SO SO important to keep learning and experimenting, you never really know what you are capable of until you try. 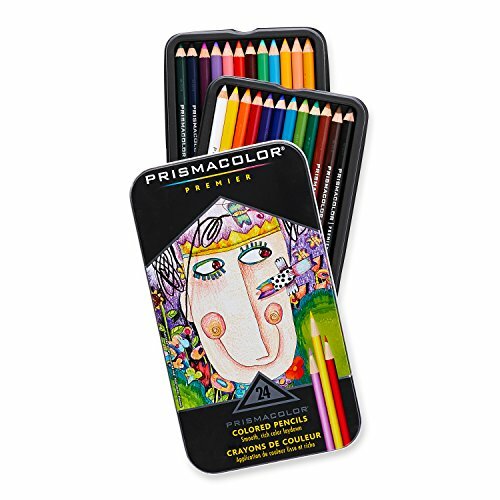 Over the years illustrators I have worked with or know of have raved about Prismacolor's pencils and so when it came to deciding which brand to use it was a bit of a no-brainer. 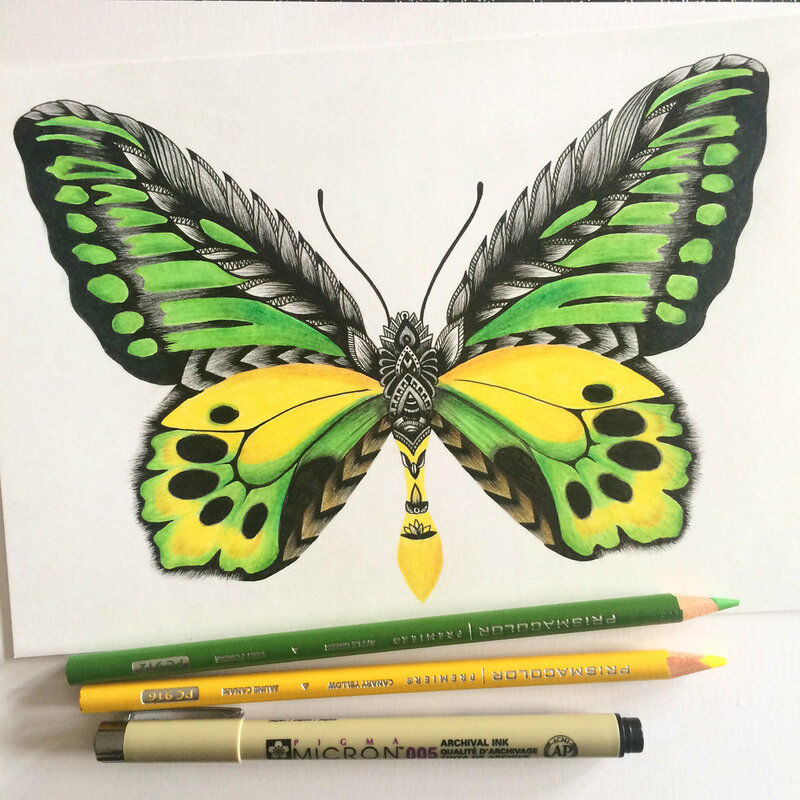 Having never used colouring pencils in my illustrations before I ambitiously decided half my inktober drawings would be created with a combination of my usual Pigma Microns and Prismacolor pencils. So yes this could have been a complete disaster! 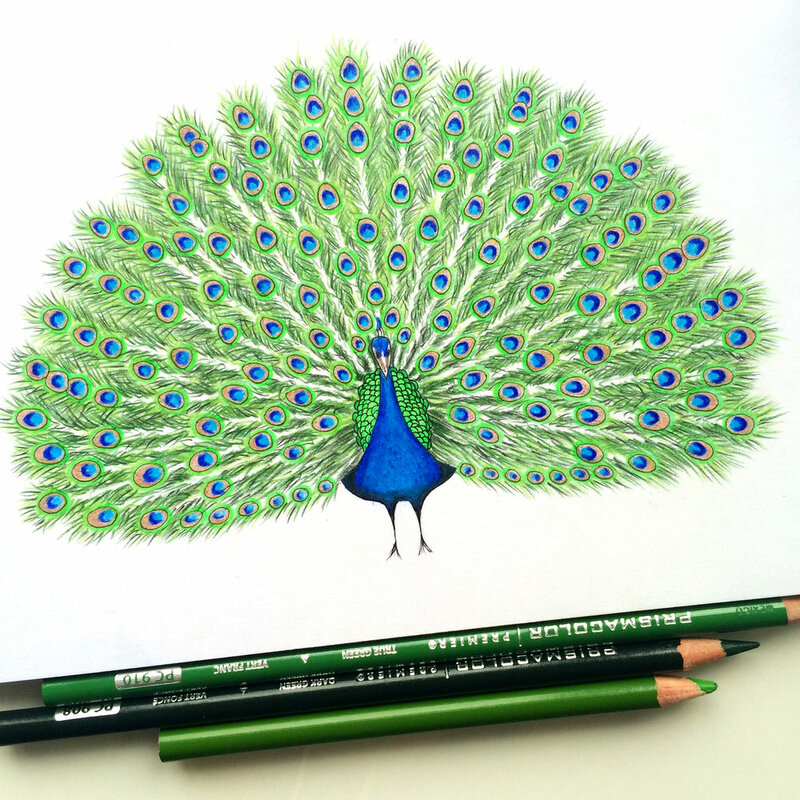 I chose the basic 24 pencil set to start with just in case I discovered colouring pencils were not the right tool for me, although there are sets that include 72 and even 150 different shades! You can also get a blender which on reflection I probably should have purchased but hey you live and you learn. The first thing I want to share with you guys is how rewarding it was to learn a whole new skill. Once you have done something for so long it becomes second nature and you just don't need to engage your brain as much. Learning how to use the pencils made the whole month more fun, exciting and challenging. In a whole month of illustrations I now know I won't be happy with every single one but the beauty of this kind of challenge is you end up surprising yourself. I have included my two favourite pieces above - the Chameleon and the Peacock. 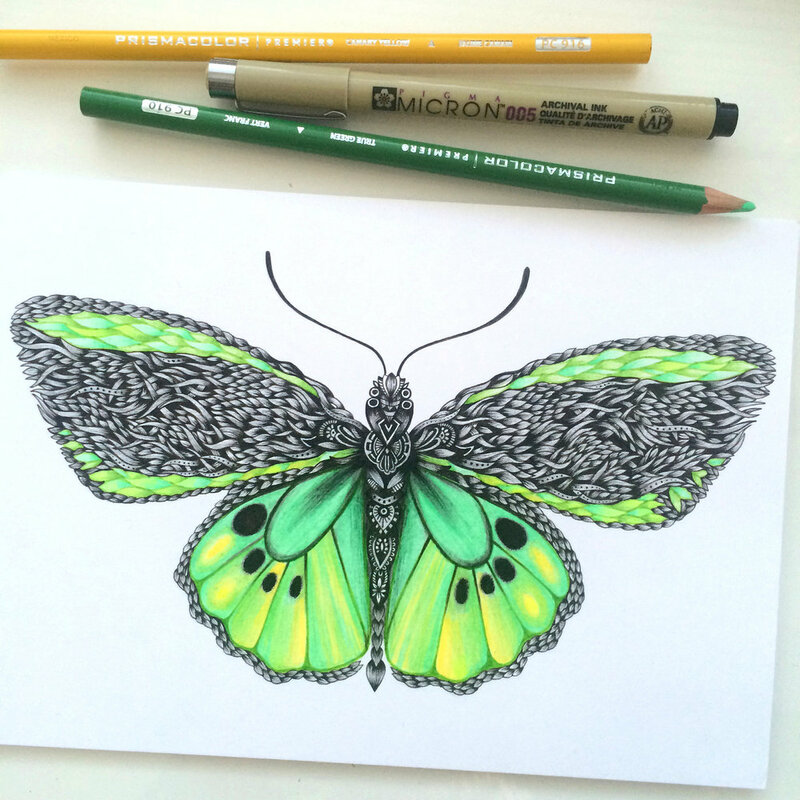 Honestly I could never have imagined being able to bring these two creatures to life in this way, it was thoroughly enjoyable to observe their natural form and then find a way to recreate this using the colouring pencils. Now I am on a mission to keep finding new materials to bring into my illustrations, some may work and some may not but it is worth finding out. The hardest thing to figure out was which colours to use and how to blend them. For each drawing I always used a reference photo so generally the colours derived from there - you can see my set up in the photo, this is while I was drawing the Cairns Butterfly. On little scraps of paper or in my notebook I would practice combinations that I thought could work well. 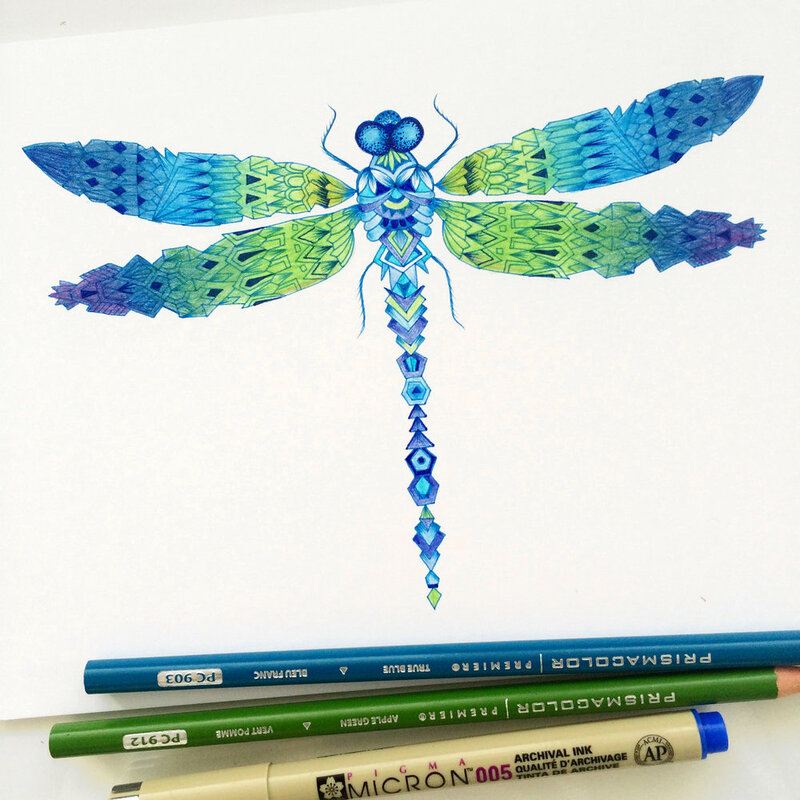 You can see the scribbles for both the dragonflies, the chameleon and the peacock in the photo, it took quite a few attempts to get it right! I discovered a few blending techniques that really made the drawing flow better. I put down lighter layers as a base first and then brought in darker shades. To blend colours I used the white pencil to get rid of that pencil texture you usually get with colouring pencils - this can probably be achieved best with the colourless blender I mentioned earlier. I also made sure for each illustration I pre-selected the pencils to use (so I wasn't aimlessly using a million different colours) and where possible I chose a colour palette that usually included at least one light, medium and dark shade even though I was quite limited in colours e.g. it could be black, dark brown, light brown or pale pink, pale lilac and dark purple. In all honesty I was making this all up as I went along but that is the only way to learn really! There were plenty of mistakes I made along the way but it is through those mistakes that you master a skill and perfect a technique. 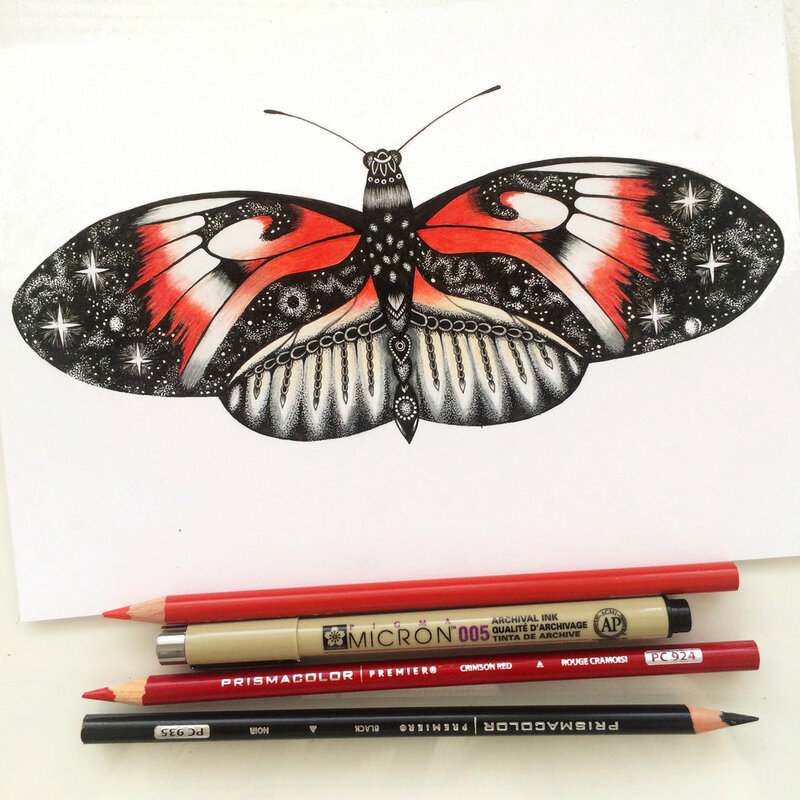 Now the butterflies (and one moth) were just so fun to work on because there are ENDLESS species each with their very own pattern and form. I went with ones that had a distinctive pattern so they could easily be identified. It is always important to me to stay true to form and colour (where possible with the limited palette) so that the natural beauty is only enhanced rather than lost. 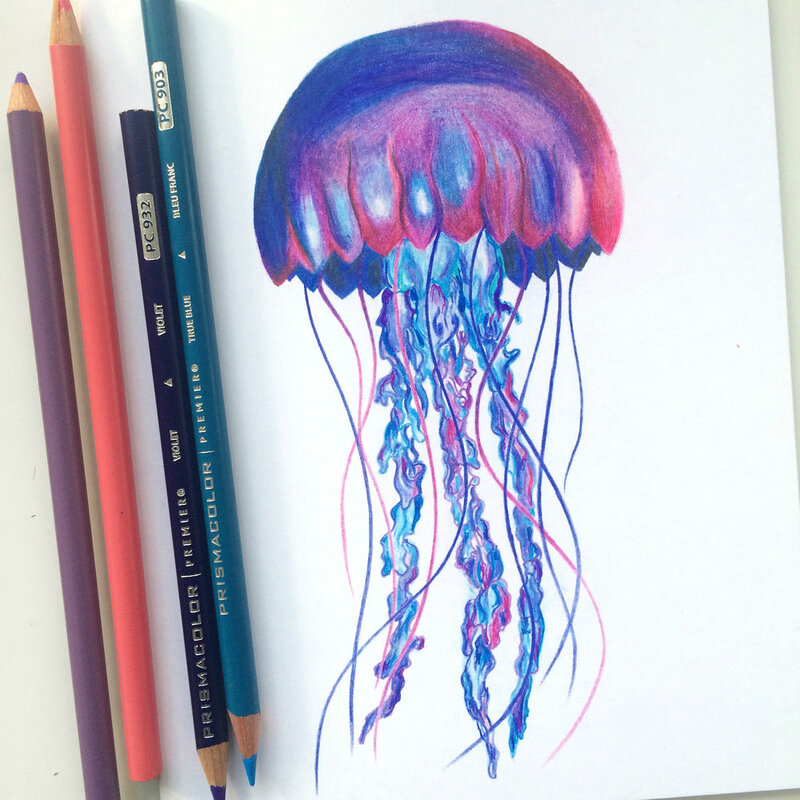 The focus of the Moth was just the colours rather than the detail making this a real challenge, but I persevered and discovered that actually with some patience I can master the colouring pencils alone - my Jellyfish below was slightly less successful but I was still getting the hang of using them at this stage. All the comments and feedback for the colour illustrations have been amazing this year and I really really really appreciate it, thank you to you and your eyes for taking the time to look at my work, I hope it brought you some joy! You can buy some of the Inktober prints in my Shop in case you are interested. If you are thinking of trying something new my advice would be GO FOT IT! What have you got to lose right?